We invite you to come visit us and see our great selection of trees! We are more then happy to offer friendly, professional advice and competitive prices for whatever size of project you are working on. Mattson Tree Farm is a family run whole sale grower of caliper trees, both deciduous and coniferous. 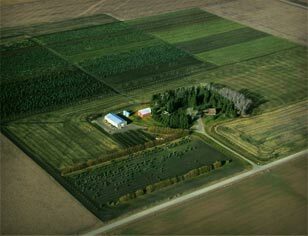 The nursery currently covers 60 to 70 acres just west of Olds, Alberta and maintains between 20,000 and 25,000 trees. Mattson’s markets approximately 3,000 trees per year, predominantly into the Calgary, Red Deer and Edmonton markets. Lining out stock is purchased from reputable growers in Western Canada and North-Western USA and grown out in a dry land nursery using sound cultural practices. Please contact us for a quote on your next landscaping project.